JOIN US! Volunteer openings in Turtle Watch will be announced on our Facebook page as positions become available (up to 25 allowed on our state permit). Become a member of the St. Andrew Bay Resource Management Association and help support Turtle Watch through your dues which start at $20. 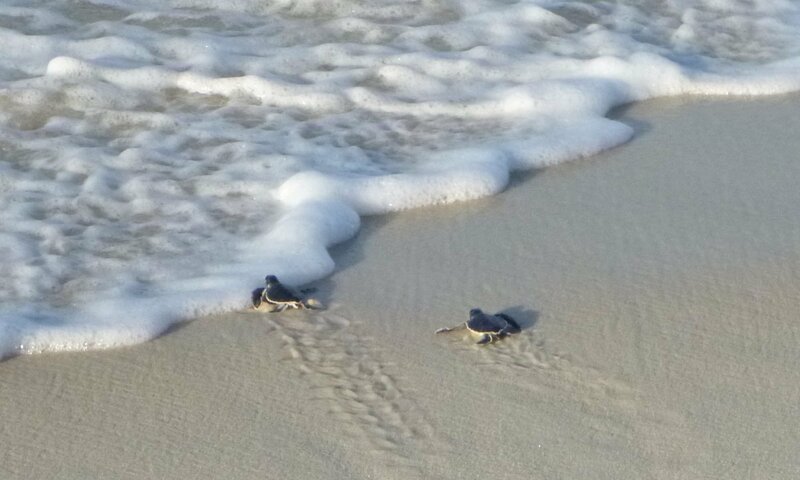 If you spot a nesting sea turtle or notice hatchlings on the beach, immediately call the Panama City Beach Police at 850-233-5000. You may watch the turtle prepare her nest as long as you avoid crowding her, and do not shine lights on her or take flash photos. REDUCE BEACHFRONT LIGHTING If you live on or close to the beach, you can “Turn Lights out for Turtles” during the nesting season from May through October. Any light source visible to an observer on the beach is likely to affect sea turtles. Here are some tips on how you can reduce light reaching the beach: (1) lower or shield outdoor patio lights, (2) place security lights on motion sensors to keep lighting off when it is not needed, (3) apply dark window tinting to windows visible from the beach and draw curtains after dark, (4) replace existing white light fixtures with shielded yellow LED lights that are less disturbing to turtles. PROTECT THE DUNES Sand dunes are the first line of defense against storms and act as a buffer to protect homes and natural habitats. Dunes also reduce disorientation of turtles by providing a vegetative light buffer between development and the nesting beach. You can help by using dune walkovers and designated beach access points to cross the dunes. SHOW YOUR SUPPORT for sea turtles by purchasing a specialty plate when you renew your tag. Proceeds fund the sea turtle recovery effort throughout Florida, including here in Bay County.